Thanks to all who came to see my demonstration in the NCECA Process Room in Kansas City. I enjoyed having the opportunity to show an alternative way of making handles and I’m thrilled that the leatherhard mug I brought from Florida survived air travel to receive the handle. I’m getting excited as I prep for the Alabama Clay Conference. I’m in excellent company among the other presenters and I’ll be handbuilder on the ticket. I look forward to meeting everyone who’ll be attending. See you on Friday! March is shaping up to be a busy month. Several events are happening now, recently passed, or coming soon. These are some of the pieces of mine in the shows listed below. Flask, $100, Shot Cups, $35 each. 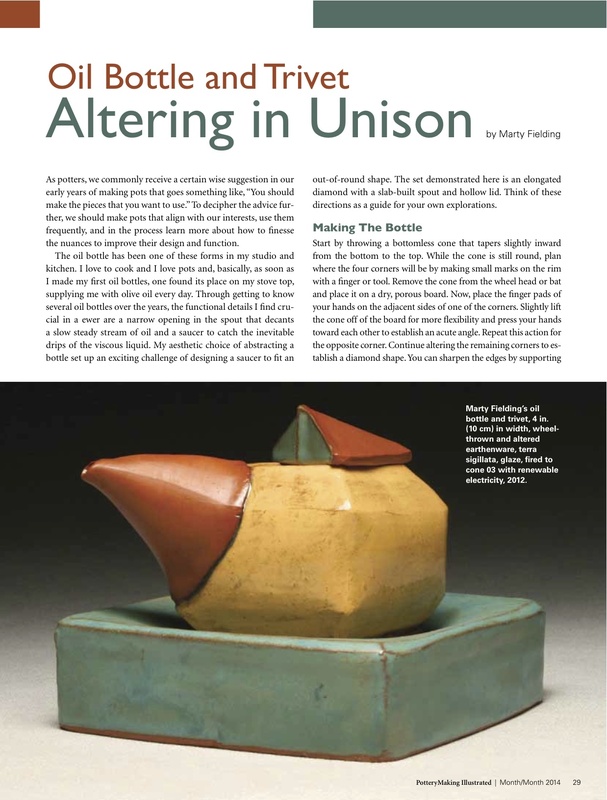 I also have an article in the March/April issue of Pottery Making Illustrated. For a demonstration of a similar piece, check out this link to my Ceramic Arts Daily DVD, Hybrid Pottery: Throwing+Altering+Assembling.